In a nutshell: You’ll feel safer, more confident, know what causes crashes, sketchy riding and be able to ride faster! Trails used: Mainly red graded trails and some natural steep sections. If you’ve just got into mountain biking, think of it as a head start. If you’re experienced, get ready to transform your riding and gain a massive boost in confidence. Feeling more like a passenger than a pilot when things speed up is all too common without solid foundations in place. We’ll iron out any bad habits and create a solid platform for constant improvement. Read the reviews for this mountain bike training course below. Bike setup check – We’ll make sure your bike and suspension are tweaked so they’re working as well as they possibly can for you. Body position for smoother riding – Understanding the physics behind riding modern mountain bikes well. How correct balance, posture and movement can rapidly improve your riding helping you ride consistently over anything you encounter. Control on steep descents – Staying in balance and maximising traction at very slow speeds, before mastering the techniques to speed up safely on steep trails. Core bike handling skills – Manuals, floating through rough sections, and bunny hopping. Where, when and how to use them to your advantage on the trail. Steps and Safe drop-off techniques – Total control in the trickiest of situations, at both high and low speed. Cornering foundations – How to maintain traction, conserve your speed and hit the best lines in and out of turns. 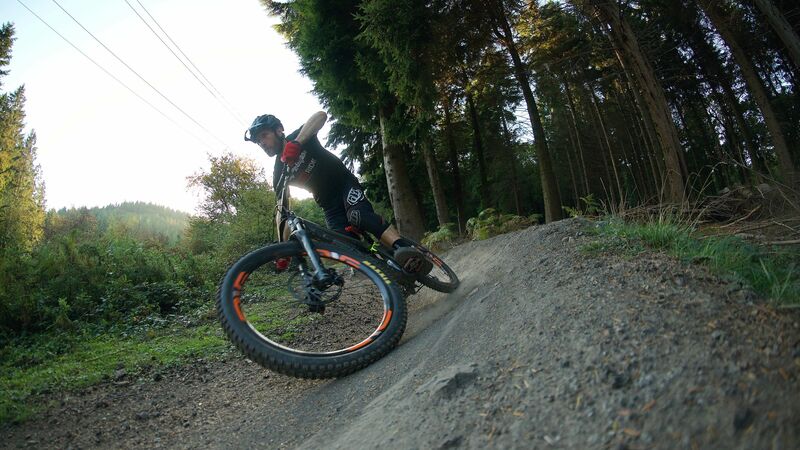 "Thanks Will for a rad day in the Forest of Dean doing the progress course! I learnt loads and now look forward to putting my new skills to the test." "Had a great time in the Forest of Dean learning skills new to me and unlearning some bad habits. With me having the co-ordination of a newborn giraffe, the instructor was going to need some patience in trying to teach me some of the skills to be tackled that day. luckily, Olly was as patient as he is skilled in riding and teaching others how to ride. I came away with with some valuable knowledge and will be practicing until I'm ready for the "Flow" course..."
"Had a fantastic training at Swinley. Olly is certainly skilled in the art of training. He is also quite informed on mountain biking. Before the course I was worried that we just cycle around and get some generic feedback. It was much more systematic, based on repetition of key skills, getting coached on each and being examined by observation and videos. Which meant I learned a lot during a short time. Highly recommend." "Joined Olly for the Progress course after learning 2 years of bad habits. Only three rides since and I can already feel the difference in my riding thanks to his guidance...exciting! Olly was phenomenal - positive, energetic, patient and attentive to our individual goals and skill levels. Progress given me a good basic framework of essential bike skills and a lot of takeaway learning points that I think I'll be trying to master for a long time! Can't wait to sign up for flow..."
"Joined Olly for the Progress course after learning 2 years of bad habits. Only three rides since and I can already feel the difference in my riding thanks to his guidance... it's exciting! Olly was phenomenal - positive, energetic, patient and attentive to our individual goals and skill levels. Progress given me a good basic framework of essential bike skills and a lot of takeaway learning points that I think I'll be trying to master for a long time! Can't wait to sign up for flow..."
"Had a great time with a good bunch on a very muddy April 2nd at Swinley Forest. Olly was great at getting the confidence levels up across a wide range of riding and gave really useful insights into how to get the most from the bike and from our riding style. Even learnt a few new tricks!" "Took the Progress coaching session with Olly at Swinley Forest, 2nd April. A great day, despite the filthy weather! Olly broke down a wide selection of skills into easily followed movements, all back up with some simple physics. Extremely useful. I really feel like I’ve now got the building blocks to be a better rider. Now to practice!" "Took the Progress coaching session with Olly at Swinley Forest, 2nd April. A great day! Olly broke down a wide selection of skills into easily followed movements, all back up with some simple physics. Extremely useful. I really feel like I’ve now got the building blocks to be a better rider. Now to practice!" "Excellent training course, highly recommend Olly and the guys. We attended on a slightly wet April day in Swinley Forest, this just pushed us on even harder. If you are a beginner or experienced rider, its worth doing this course. Cheers chaps." "Attended the course on Sunday 11 Feb. Although I was a good bit older than the other riders I had a brilliant day. Easy to understand instruction had me riding with far more confidence and speed. Can't recommend this course too highly." "Such a great day. Learnt absolutely loads and really helps getting video feedback, demos and advice constantly so improving each time. Would highly recommend this and I can’t wait to get out there and practice it all now! Olly had great coaching style putting you at ease but also having fun and tried things I wouldn’t have before. Thanks :-)"
"I attended the Progress course yesterday in the Forest of Dean with Olly Morris.still haven't stopped grinning. First i'ld like to say that Olly is an absolutely brilliant, natural teacher whose passion for this is infectious, he makes it fun and easy to learn . I hadn't been on a bike for about twelve years, and it quickly became apparent that everything I THOUGHT I knew (which honstley wasn't a lot) was going to be put right. I can't recommend this course enough my confidence has grown immensely with now knowing the correct way of doing things, which has increased my life expectancy immeasurably. Sorry Olly if I've given you grey hairs after yesterday, I'm sure I'll have improved by the next course ? Thanks again. Rob"
"Really informative and fun day, I have been riding for a while and found this course good for validating technique and also for pointing out areas for improvement. Olly was really good at explaining the theory and then talking through the videos captured after each core skill. Highly recommend and definitely booking more courses"
"Huge thanks Olly top bloke. Patient and thorough, got to go through loads of aspects in biking. What Came across the most is body position is key to everything. If your unsure on whether to take the corse or not go for it you won’t be dissatisfied. So much info to go away with and work on but even at the end of day ride down I could feel the difference in speed,line, position and confidence. Will be booking flow when I’ve worked more on what you’ve shown us???" "What a day, had a group lesson with my son and a friend. Straight of the bat Olly’s enthusiasm filtered through the small group. The planning of our day was explained and in a manner that was easy to digest. My 9 year old soaked up the information. We have been riding for a while now but the skills even the basic “home” position has meant our riding has improved massively. Olly is a very personable guy and his love of MTB shines through. A great great day. Will be doing it again very soon." "Had a private session with Olly , got to say best day I’ve had , learnt more in one day than I’ve done all summer , very professional, looking forward to my next couching session in January, many thanks"
"Charlie did a great job instructing the Progress course. Very dedicated, knowledgeable and positive young man and a pleasure to spend the day with. We picked up allot of skills and tips and its was great fun." "Great course, coached by Olly at the Forest of Dean. Even though I have been mountain biking for years I now understand more and learnt a number of techniques which will help in the future. Now going to book 'Flow' I recommend excellent coaching, fun and friendly." "Had a fantastic day in the Forest of Dean being coached by Olly. Started the day a couple beginner with a few sketchy runs under my belt; ended the day feeling in control and faster on the descents. It can be a bit daunting when faced with a mixed ability group but the coaching was tailored so that every one was Progressed throughout the day. I now feel I've got some solid foundations to build on and plenty of drills to practice." "Gained some real confidence from Joe at Stainburn at the weekend. Very useful, thought provoking and downright fun course the guy's a legend and he can ride a bike a bit too! Had me bunny hopping over a log for the first time in about 35 years. Can't recommend it enough either if like me you're a bit hopeless on a mountain bike and don't really know why or you're OK at it but want to acquire some new skills. Cheers Joe!!" "Learned so much from Joe on the Progress course at Hamsterly. The difference it made to my riding and confidence on the day really surprised me and i look forward to practicing these skills as often as i can 10/10"
"What can I say! what a day, booked the progress course down the F.O.D. Our coach Olly Morris was fantastic and gave us feedback and encoraged us throughout the day on all the tasks we covered. I can now see why some of the more experienced riders i try to keep up with are doing what they do and as the day progressed everything fell into place. would highly recommend this course. Came away buzzing." "The course did exactly what I wanted in addressing my position on the bike. Olly is a great teacher, breaking things down and explaining the reasons for things, which I think will make it easier to remember. I'm definitely inspired to get out and practice!" "Just completed this course at the Forest Of Dean (14/01/17), really got a lot out of it, Olly was great. Just learning the basics of weight distribution, positioning on bike etc showed me all the things I was doing wrong. We Progressed onto cornering where Olly demonstrated and we practiced on where to weight the bike, shoulder, hip and leg position which was really useful and again something I wasn’t doing. Lots of things to work on now over the next few month. Olly many thank for an informative course and a great day in the forest." "Jo Flanagan was fantastic, he really explained everything in simple terms. Even the things I was already doing were made clear and re-inforced. I left feeling totally inspired to get on my bike & practice !" "Progress is a great course if your looking to get back to basics and learn the core skills you need for mtbing. I did the course at the Forest of Dean with Ben Deakin who is a top coach breaking every skill down into sections. Since doing the progress course I'm already thinking differently when out on the trails and its given me greater confidence to go for more challenging jumps and drop offs which is what I wanted to get out of the day. Will be booking the air time course soon! Thanks"
"Joe Flanagan delivered a great days training for the Progress course at Stainburn. Dealing with the basics of successful riding, he covered the key skills of body position and weighting that I've tended to overlook, but determine how well anyone can ride. Joe's teaching style is relaxed and easy to follow, but backed up by some real talent! Great course as a refresher, or an introduction." "Great day on the progress course at Forest of Dean.Ben is a great instructor. Can't wait to get back on my local trails to practice my new skills. Then I'll be back for another course!" "Had a great day at Forest of Dean doing the progress course with Ben Deakin, brilliant instructor and really good course, would definitely recommend to anyone thinking about one of these courses. Will be signing up for the flow course next." "Brilliant day out with Ben deakon showed me lots of new skill which I will testing out on the trails and when racing enduro great day thanks"
"Really worth going on this course, you think you're good, but this opens your eyes and mind to make you realise how much more there is to learn. Great day and great instructor, thanks Joe"
"Been riding for 20 years and needed to see where I could improve my riding to become faster. The progress course showed me ways to improve and straight away I feel better on the bike. Definitely going to do another course with Pro Ride." "Thanks for a great day Joe. I feel that I've learnt loads on the course. I'm certainly more confident, and hopefully competent, on the bike now. I look forward to trying the Flow someday." "Really good course with a relaxed atmosphere. Joe stripped everything back to basics and had an easy to understand and fun teaching style. Highly recommended for any rider regardless of experience. Thanks Joe!" "Great day with Joe at the Forest of Dean - learnt so much - he's an excellent coach & teacher - I would highly recommend this course its given me the confidence & understanding to be a better rider"
"Great day with Ben at FOD , The Progress course sowed a lot of seeds of what i should be doing to ride with more control and flow. Look forward to Flow course sometime in the future.Cheers"
"At a great day at stainburn ,learned loads from joe fab coach , already seeing a difference on the trails thanks again j ????????" "Ended up with a one to one session with Joe F. Mega day, my riding has moved forward so much, 4 L's and hips, feet feet feet.haha cheers mate genuinely learnt loads. It's made me enter the DH event in Forest of Dean on the 6th Dec. Fingers crossed." "Brilliant day at Stainburn, learnt a lot from Joe F, just need to get out and practice now. If you are thinking of doing a course, do it! Will be back again. Thanks a lot." "Great day with Joe at Hamsterley. He has a friendly and patient approach with everyone to help improve our riding and is very encouraging. Starting with the basics and moving up throughout the day. By the end of the day I could feel the difference in my riding especially in my cornering. I highly recommend this and will be back for some more in the future. Thanks Joe." "Really had a great day with Joe and I’m keeping all his advice in my mind during my riding, beginning to feel some effects! Can’t recommend this course enough!" "Booked up for the Progress course and the Tech course over the weekend, Alex was on hand to take us through a whole load of skills and techniques,his coaching and knowledge was excellent,transformed my riding thats for sure. I feel that i have become a more confident and better rider for it.Thanks Alex for a great weekend.Roll on Airtime." "What a day! Still trying to soak it all in! Right from the off you know that you’re going to have a great day on the bike, joe comes across as a guy who loves the sport and a guy who gets as much of a buzz from seeing improvements in his riders as he does from riding. Starting at just riding the trail while being watched, you soon start getting down to the fundamentals of fast and controlled trail riding, rider position and pressure control being the main focus of the course. Starting on groomed trails, it’s not long before you’re riding serious rocks and roots like they’re groomed trails, seeing new lines and ways of using the terrain confidently, hamsterly is a perfect venue as the mix of trails there is superb, lots of flow but sections of near alpine terrain. Joe is the kind of guy who really gives you confidence in your ability, and by the end of the day our whole group nailed the big drop on hamsterly’s main DH line, the highlight of the day for me though was following joe down the 4x track, and having a blast down the trails at the end of the day. I won’t forget that feeling of trying to chase an elite level racer in a long time! Lightening quick, no big ego just a big personality, and an all round top bloke. Highly recommended!" "Well what can I say, what an awesome mountain bike skills day. I didn’t think I had it in me to have a go at some of the features at the end of the day but with the coaching of Joe who breaks every point don’t so everyone can understand. Builds up your confidence and even seeing your self doing it right is a big boost, going through the stages, practising each step until it all combines without you even realising it then pulling it off is amazing. I’m going to be booking myself onto an airtime course in the future, I would recommend Pro Ride mountain bike coaching to anyone who wants to improve on their mountain bike skills." "After spending lots on my new bike I thought it was time to spend some on me and sorting out my bad habits I have picked up over the many years. Alex did a great job and I can now ride smoother and faster. I learn’t more in one day than I would have in many weekends of practice." "Excellent course and highly recommended. Joe takes time to explain some of the theory before gradually putting it into practice, this really helped me understand what I needed to do to improve my mountain bike skills. It worked, by the end of the day I was definitely cornering faster and felt much safer and more in control of the larger drops. Will be back for some air time! Many thanks Andy." "Had an excellent days coaching at FOD with Joe. Lots of advice on everything from bike/body position and techniques, bike set-up, reading terrain and line choice. All broken down and made simple to follow. Come away with loads to work on, great day money well spent. Cheers Joe"
"Joe started from the bottom and built up in small easily digestible pieces, was a good day with plenty of crack and learnt so much! Problem I have now is I crash all the time as I’m riding much faster than I used to! Don’t confuse crashing with falling tho as what he taught us on balance has me very stable on the bike." "Really good positive coaching from Joe, I had a very good day and learnt many important skills to improve my riding , looking forward to taking part in more courses. Cheers Dave"
"Been mountain biking for a long time and reached a limit of what I felt like I could achieve on my own, lacking in a bit of speed and confidence in what I could handle and what the bike would take. What a brilliant day in very testing conditions. Despite the weather Joe was fantastic and very patient. Good to see film of my riding giving feedback for immediate improvement. Felt myself feeling more confident and can’t wait to get back out to test what I’ve learned. Can’t recommend Pro Ride enough and I’ll be back for the Tech next year. Without wanting to give away trade secrets, feet, feet, feet. Elbows UP!!!" "Angela and I spent the day under Ben’s guiding eye. Excellent day, really enjoyed it - despite rain all day. Ben is a great coach and communicates the process of what to do very well - totally recommend Pro Ride. I will be back for more on hopefully, a much drier day :)"
"Great relaxed vibe from the outset, started with a conversation on what we would like to gain from the course and Joe endeavoured to cover all of our concerns and did so more than adequately. A true jaw dropping experience to witness so many faults within riding that 99% of people are doing every ride. The course left me with a totally different feeling ride due to suspension tweaks and renewed sense of confidence, resulting in faster smoother riding in all conditions, THANKS JOE, see you again soon." "Absolutely brilliant day in monsoon cold conditions at hamsterley. Really still an enthusiastic novice, but Joe and the other Joe made me feel at ease and I have definitely taken loads away for me to work on. By the end of the railing berms bit we had all pretty much nailed it making massive improvement and the video slo mo play back of each riders runs really helped a lot with understanding the little things to change. Shame about the downpour. Will definitely be back, with mates! Thank you for a brilliant day with a great bunch of people." "Had the privilege of being coached by Joe R today on the flow course at Hamsters. Totally stoked! Joe puts across important concepts really well and is brimming with helpful anecdotes and tips. The hard part, is now to put it into practice - feet, elbows, big, small! Loved the enthusiasm from everyone else on the course. Like minded folk who are happy just riding their bikes - can’t ask for more. Would thoroughly recommend this course from beginners to advanced - there is something to learn for everyone." "Three of us great mountain bike skills course with Al Rafferty. Back to basics and very quickly realised what we have been doing wrong for the last 10 years. Even better news was that we managed to fix this in only a few hours. Then a mix of cornering, berms, Tech and a bit of air. I have already recommended this coaching to tens of people as the best mountain biking investment ever (next to a seat dropper of course :-). Keep up the good work guys. Will see you again in the future." "I want to thank Joe for an absolutely superb days coaching. Joe really knows his stuff and made the day interesting, enjoyable and fun. He very quickly was able to pick out the areas to work on. Over the day I couldn’t believe how much more control I was in and how I was able to ride faster and more smoothly. I love biking but the day has progressed this to a new level and motivated me so much to go out and continue practising and learning from what Joe taught me. What he teaches has transformed my riding and given me the understanding to progress more. I can’t recommend the day enough. Fantastic. Thanks Joe"
"Great day with Ben, learn so much from his knowledge, now to put it all into practice! Even though there were biblical conditions at the FOD centre on the day it made for much better riding and learning on the wet roots/rocks etc. Would very much recommend Pro Guide Rides to anyone. Cheers"
"i really can’t recommend Joe enough we had a fantastic day and really benefitted from his tuition - will definitely be back next year to take it to the next level keep up the good work guys !!" "Thanks for a top quality session at Gisburn. Having never been on a skills/coaching day before I was unsure as to whether I would enjoy the experience but I now thinks it’s one of the best upgrades you can buy and something that will last at lot longer than some bike bits. I think your approach to teaching and how the whole day progressed worked really well and I have definitely taken away some key points that I’ll continue to practice whenever I can." "Excellent day, despite weather! Graduated teaching proportionate to skill level of group. Engaging teacher, we learnt a lot many thanks. Highly recommended." "It was a blast! By the end of it, I was so much more confident and had a bunch of new skills that I can work on. They will make the world of difference to my riding. Thanks Pro Ride! Awesome!" "Had an excellent day improving my riding and Joe sorted out my braking for me. Would recommend to anyone who wants to move up a level while riding some great trails with 2 top coaches." "PROGRESS Course. Know the value of a great coach! A cliche, but so true when it comes to Pro Ride. We had a great day. Progressive is a very over used word these days, but the way Alex built up the skills over the day was really good. Early on I thought that we were going to just learn beginners stuff, but the programme soon found my level and weaknesses (e.g. body weight wrong in flat turns and the my flat out refusal to do the big rock drop at Stainburn). By the end of the day I’d nailed the rock 10 times in a row. Book yourself onto this course with Alex and Joe; you will not be disappointed. I’ve just returned from my usual route today (a week after the course) and I was hopping and playing on everything in sight along the edges of trail and had way more fun. Just signed up up for the Flat Out Fit programme, so looking forward to that too." "feet,feet,feet, get your bum off that saddle, what a mantra. Thanks it worked. Great days coaching by Joe and Alex pointing out what I missed thanks for getting me over the rock drop! And...next, getting me some air..feet,feet,feet......"
"Booked on to the progress course in March. I was still breaking in a new orange 5... and omg, it really is awesome (both the bike and course)! I can hardly believe how much progress I made throughout the day. All thanks to excellent coaching. Alex gave very clear instructions so we all knew exactly what to look for in our riding. Everything new started small and built up to as big as we could handle. It was awesome!! The day was made up of just the right amount of training exercises vs putting it all into practice. I never felt completely out of my comfort zone but at the same time was pushing things up a notch every moment." "Had a great days tuition with Joe at Stainburn. Joe started off by explaining a couple of fundamental points that are at the core of mountain biking and then showed how they applied to various types of trail feature. I felt I made definite progress on the day and have an understanding of what I need to work on to massively improve my riding. In an age when everyone is searching for the quick fix a days mountain bike coaching with Pro ride might just be it - in mountain biking terms anyway!!" "AWESOME!! Been a newcomer to mountain biking (4 month) booking the course straight away i felt i may have been a little eager and felt a bit apprehensive but at 43 i needed a little catch up. Not disappointed there then. Rode Stainburn to see what we were in for and found it quite difficult and an eye opener, rideable but stopping frequently. Within 15minutes in the car park, brake levers sorted, sags, (one set of forks fixed with an extra 2 inch of travel). Calling it the basics is patronising to everyone riding the trails on a regular basis, i like most can ride the trails have watched others and followed there techniques but they never look like the guys on demos and you tube. But using the BASICS of the progress course i now witnessed 5 guys all on our course cornering like the guys you watch in awe and as we learnt the basics of each section. Seeing how not to do it and the benefits of correct technique, everyone we moved out of the way for who were riding the trails was a perfect example of the poor technique. Once shown its almost obvious and common sense, to me personally i feel i have been let into a little secret. Unfortunately i was the only one in the group not to tackle the boulder ( wanted to soooo bad) but was ecstatic to hear my 14yr old say what the hell and ride straight over followed by a further 6 times. Hit the descent for a couple of runs, didnt stop once, flowed like a dream, flat cornering technique awesome and finishing as relaxed as i started. Cannot wait to put it all into practice, ticked every box"
"Did the PROgress course at Stainburn. Been biking for a year now and have read loads of artcles on skills but there’s no substitute for someone actually showing you. Very informal & easy going - puts you at ease straight away. I have learnt more in 1 day than I have the past year - got to be the best upgrade going!!" "We met Joe at Stainburn and rode the short red route a couple of times, Joe explained that we were probably riding as fast as possible with What we were currently doing. After various practice drills to improve our position and movement on the bike we rode the same section again - the difference in confidence, speed and flow was unbelievable. Joe broke everything down to bite size chunks and was able to explain things several ways to improve our understanding. I would recommend Joe and Pro Ride to anyone wanting to be faster, smoother, safer and wanting more fun on their bike. I’m off to rip up the trails now :)"
"Fabulous day at Stainburn, under Alex`s guidance. Have been riding technical trails confidently for over a decade and still learnt masses, improving hour by hour. Wish I`d done it long ago"
"Stainburn course what a day we had and how good was the coaching. Its amazing how many bad habits were revealed and how easy it was to work them around a bit. Great day Alex!" "What a fantastic day! We started the day with a test ride on one of Stainburns short trails, but around half way down, took a wrong turn and ended up looking down a slab of rock. Immediate thoughts were Not in my lifetime!and we turned back onto the red trail to carry on. Joe worked on some back-to-basic skills instilling the stand strong riding position. Around 2-3 hours later, I found myself rolling down the rock face with no issues at all. In fact, I’ve never felt more stable on a bike! You can buy all the gear, bikes and bling you like, but there is no better investment to get the most out of riding than working with Pro Ride. I would whole heartedly recommend them to anyone looking to become a faster, smoother and safer rider. Enjoy!" "Both had a great day at stainburn with Joe on the progress course both been riding 20 years plus and learnt so much in one day its unbelievable i cannot recommend this course enough, big smiles and big thanks"
"An excellent day was had at Stainburn with Joe, his coaching was second to none, his explanations were easy to follow making what looked impossible possibly. We will continue to go from strength to strength and man up on the black routes!! Thanks for a great day." "At the start of the day i could ride most things, but i was perhaps on the edge of crashing at the speed i was riding. After a fun day with Joe i could ride the same route tackling every obstacle much quicker but also totally in control. Obstacles that looked sizeable at the start of the day magically shrunk in size which says it all really. I will definitely be back next year on another course to build on what i have already learnt." "Big thanks to Joe for a great days coaching last Sunday. By the end of the day I felt a lot more confident and capable of tackling trail features that phased me at the start. I was also surprised to discover a few new muscle aches the following day which shows I have adopted a new (better) riding position after 15 years riding! highly recommended." "Really good course, thoroughly enjoyed it and learned loads. It has completely transformed how I think about riding a bike! Will definitely recommend and use again." "10 years riding, 1 days course @ Stainburn and it did exactly what it said on the tin Progress I can highly recommend." "Just a quick thanks for Saturday, I learnt a lot. Been up at stainburn today and on the red decent back to the car park I’ve knocked 30 seconds off my personal best time!!!" "A great day out - especially for me as a novice. i have learnt a lot of new skills to allow me to enjoy mountain biking safely and to have fun at the same time. Plus alex found a fault with my new bike during the setup check - thanks alex (unfortunately the bike is back with the manufacturer to the problem out. Well worth going on the course." "Progress! Exactly what I’ve achieved after a day with joe! Highly recommend for an enjoyable day out. Cheers joe"
"My aim for the day was to ride with more confidence and that was achieved. Joe explained things very clearly and nothing was too much trouble, a brilliant coach. His enthusiasm for biking is infectious, very grateful for the improvement I have noticed!" "If your not sure whether to book a course or not, all I can say is DO IT!! It’s a great day, you’ll learn absolutely loads, it’ll change the way you look at trails and how you ride! I can’t wait to get out riding again and start putting it all together! I’ll definitely be booking on the more advanced mountain bike skills courses in the future!" "I found the course and Joe to be easy to understand and very positive in his coaching with simple tips and advice on all aspects of my riding. Feel that at least I know what I should be doing finally and what I did pick up on the day has already had a positive effect on my riding and confidence. Will be coming back for further lessons which is the best endorsement you can have. Cheers Joe! PS Death Grip is my favourite new game!!!!" "Brilliant! Ridden Swinley Forest mountain bike trails many times but never as smooth as after being taught by Alex the best technique (Feet), had me dropping in off things I’d previously looked at and said, No way! Thoroughly recommend and will be looking to do more once I’ve built I’m some better fitness"
"I cannot recommend this course enough, from novice mountain bike rider to someone who thinks they know what they are doing, Alex breaks down your riding and builds it back up in easy to follow steps and techniques. The way the skills course is presented, the simplicity of the teaching means that you can pick up and practice the new techniques very quickly and you soon find yourself riding smoother, with more confidence and ability.. all of which adds up to making you faster and safer on the bike. PERFECT!" "Location: Swinley Forest. Coach: Al Rafferty. Really well paced course, all with two wheels grounded so don’t be put off by the crazy pics on the website. Al was a really friendly coach and teaches a great set of techniques. This is a perfect course for anyone looking to ride a bit quicker, a bit safer and with more flow. Don’t keep bashing yourself around those trails, invest in some good technique with Pro Ride - It’s worth much more than hanging new kit on your bike." "brilliant! brilliant! brilliant! I was very nervous about doing this course as I am a complete novice having only done a couple off red trails. I also had a hardtail bike, this only held me back on the large drop we encountered (gutted I could not do it by the way)none of this mattered though as joe was superb and I was much more confident by the end off the day. Dont think twice just book it, an amazing day!!" "I wasn’t sure what I was to expect from this course as I didn’t think after 2 years of drilling my own technique into myself that I could learn much more? How wrong was I!? Joe was an excellent coach and basically showed us how to ride our bikes safely and balanced and with much practice, I definitely know what Joe showed us will make us far better riders. This is an excellent course with a great bunch of guys and I wouldn’t hesitate to recommend it to every one who rides bikes be they beginners or experienced riders, there’s always something you can teach to an old dog. Nice one Joe"
"Stainburn Forest with Joe What a brilliant day - probably the most important investment in mountain biking after a helmet! Joe’s coaching brought us along enormously - from riding ‘in spite of’ my lack of talent and ability, I came away with a solid platform to ride safer AND faster. And now being able to critique my own riding so I know why sometimes you hit that sweet spot and the trail flows, and why it went mostly wrong! I cant wait to put this into practice on home turf. Highly recommended for anyone that wants to be able to go faster or is looking to get more enjoyment out of their mountain biking. Feet..Feet..Feet"
"Very good course! Great atmosphere, great fun and loads of input. Alex didn’t just show us how to ride, he made us understand! I am still shocked how many mistakes I did before that course. Not just has my confidence and riding improved, I know now what to look for and what to work on. Will definitely book another course soon. Thanks a lot Alex and see you soon!!" "Fantastic day at Stainburn, being the only girl in the group i was a little apprehensive but Joe made me feel at ease and I was soon riding drops and technical sections that normally I would have walked around!!! Just remember feet and low!!! Would recommend to anyone who wants the secret to progress ;)"
"Wow, Turned up as a complete novice having never ridden a Trail, or a Down Hill decent. With Alex showing me how to set up my bike and expert tuition in MTB riding by the end of the day I was riding like I didn’t think was possible. What he cant do is give you fitness and strength as a novice my muscles ached, get your quads conditioned. Thoroughly enjoyed the course and highly recommend it to improve your skills beginner or advanced. Cheers Alex keep up the great work." "Want to say a massive thanks to Joe - after 2013 being a year lacking of riding my confidence and technique on the bike was severely lacking! A day with Joe on the progress course was just what I needed - the best coach I’ve had on a skills course by far. His energy and passion for biking is infectious. Will be coming back for more! Confidence boosting - just what I needed!" "Feet!Feet!Feet! What a day with Joe at Stainburn! My riding had plateaued and I was struggling to work out what I needed to work on. Joe took us back to basics dialling in some core skills and gave us the confidence to do them at our usual riding paces and beyond. He never pushed anyone any further than they wanted to go and had a smile on his face all day. A top coach and a true Gent. I’d recommend these guys and this course to anyone :)"
Leave a review for Progress here.